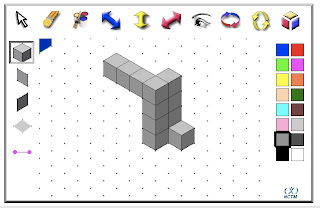 If you teach your students how to do isometric drawings in 3D with views from the front, the left side and the top, this tool is for you. It can be used both by the students and thee teachers. The student may model structures in 3D made from nestable blocks and then visualize them by rotating them in all directions. It is also possible to add colours to the blocks. The tool is a simple Java application, so it will run virtually on any computer with an Internet browser, no matter the operating system. The application is very easy to use and include almost no text. Even students who find reading a challenge will have no problem using the icons. The National Council of Teachers of Mathematics provides the application. The teacher may also use it to prepare tests and worksheets. There is no tool to export the picture as a JPEG or PDF, but a simple screen grab will do the trick. It is then possible to paste it in a word document.